Massive protests have forced the Baathist regime of Bashar al-Asad to lift the state of emergency that has governed the country since 1963. Every citizen has the right to freely and openly express his views in words, in writing, and through all other means of expression6242. He also has the right to participate in supervision and constructive criticism in a manner that safeguards the soundness of the domestic and nationalist structure and strengthens the socialist system. The state guarantees the freedom of the press, of printing, and publication in accordance with the law. Of course, the Baathist state has no intention of actually implementing these lovely sentiments. Authoritarian states do not actually need an emergency law; they can just repress. Much of the constitution refers to statute for the content of specific articles. The protesters fear that the al-Asad cabinet will pass regular laws now that are just as restrictive as the old emergency decree. 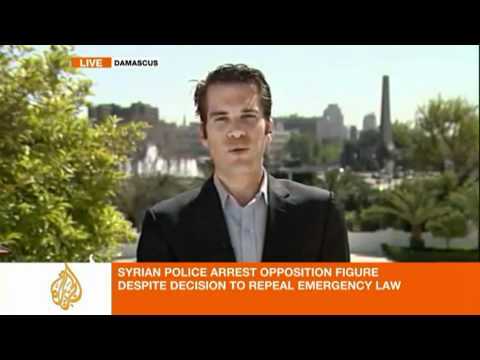 The steps toward abolition of the emergency law did not appease the protest movement in Syria. Some 4,000 student protesters came out in the southern city of Deraa on Wednesday, and a much smaller such student protest was held in Aleppo in the north. Protesters are calling for massive crowds in the street on Friday. On Tuesday, thousands of protesters are said to have been cleared from the central square in Homs. Protesters had tried to get a Tahrir-Square-rally going on Sunday and Monday but had come under live fire, taking numerous casualties. The city was quiet Wednesday but protesters seem undeterred.